Certain careers lend themselves to diverse learning opportunities. I had no idea of this in high school - hadn't even considered it. However, after trying several different careers, it seems to me that some have more choices than others. For example, in printing there is definitely choices in how a young adult can specialize. When I learned how to print, I originally learned on a 'forms' web press. This kind of press printed off of paper that started on a roll. It then printed, cut, and folded envelopes and pamphlets on the fly for magazines etc. Then I got trained on a larger web press that printed the magazines themselves. Then I learned how to operate a couple sheet-fed presses - rather than starting with a roll of paper, these presses use pre-cut sheets. Finally I worked for 4 years on a newspaper press that could print a 48 page newspaper with color using 6 rolls of paper at once. 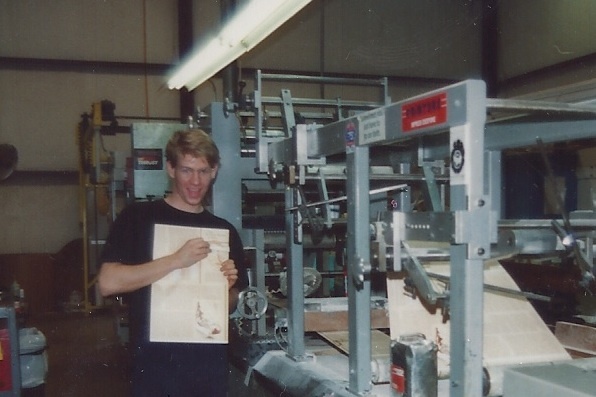 I could have worked on any one of these presses for the rest of my life. But opportunity arose for me to learn another, and I took it. However, my experience was limited to the print shop, ink and water, paper and scum, etc. Often we'd print the same jobs (or similar jobs) on a weekly or monthly basis. There was some diversity and opportunity for learning. I'm not just learning and using the software technologies that these firms use, but I also have to learn about their businesses so I can properly build and support their software. There are other careers in the workplace that afford similar opportunities. Another example is working in the Police Force. Sure one can be a cop on the beat, but there are a bunch of specialty fields in policing that could potentially make the job interesting. Just think about an episode of CSI - there's specialists in studying bugs and their stages to determine how long a body has been dead. There's specialists in financial forensics, chemical forensics, biological forensics, technology forensics, etc. There's the canine unit, the SWAT team, the air unit, and more. Every business in every industry needs an accountant (or a bunch of them) to deal with revenue, taxes, bills, etc. A career in accounting can afford a person a lot of opportunities and experiences. Many accountants eventually work their way up to become CFO's (Chief Financial Officers) or even CEO's. Another example is working in journalism. Journalists have to learn about what they write about. Consequently it can be a very interesting and diverse field if a grad or young adult is a good writer. Even Lawyers have specialties. I recently read an article about a lawyer that specialized in law surrounding the international trade of antiquities and archeological artifacts. Who would've thought? When young adults are thinking about a career, they should consider which ones afford them the most options. Or, conversely, if a graduate is passionate about something in particular, he or she shouldn't think that it limits them to only certain career choices. Putting a passion together with another career can be dynamite. Don't miss our 'Career Resources for Graduates and Young Adults' page! It's got a nice collection of links related to careers and direction.